It is currently accepted that matter is formed by fermions and bosons. Fermions are particles that have half-integer spin and are ruled by the Pauli Exclusion Principle, they can not be placed in the same location at the same time. Bosons are considered as particles that have integer spin and they do not obey the Pauli Exclusion Principle. It is known that a Dirac fermion is a fermion that is not its own antiparticle. Antiparticles are those that have the same mass than their associated particle, but an opposite charge. For example positrons – predicted by Paul Dirac – are the antiparticles of electrons, they both have the same mass but positrons have a positive charge and electrons have a negative charge. Positrons an electrons are not considered the same particle, they are Dirac fermion antiparticles. A Majorana Fermion is a fermion that is its own antiparticle, they are not different particles although they have opposite attributes. All fermions are considered currently as Dirac Fermions, with the only exception of neutrinos that is discussed if they could be considered as Majorana fermions. Here we are going to explain and to clarify the distinction between Majorana and Dirac fermions through the entanglement of periodically variable gravitational fields. If you have read other articles of this blog, we consider that gravity is cyclically variable. We defend that all gravitational fields expand and contract periodically. And when at least two gravitational fields intersect – entangle – they create in their intersection 4 periodically variable fields – dimensions – that for us are the atomic fundamental particles. Current science is unable to integrate gravity and electromagnetism in an unique and unified theory. But they affirm that gravity is insignificant at atomic level. We consider that all atomic bonds, fundamental interactions, Van der Waals and Casimir forces, electromagnetic charges and radiations, are all created by the intersection of two gravitational fields that vary with the same or different frequency and phase. They all are spatiotemporal issues. At a first moment Dirac thought about an electron with a positive charge moving with a negative energy. But it was impossible for classical physics. So he thought that it could be a different and opposite particle, the positron, moving with a positive energy. But what are positive and negative energies? Here we are going to consider positrons under a Majorana perspective. Positive and negative are relative and conventional terms, they refer one to another and they are determined by opposition between them. If we have a higher level of energy in a specific time and later this energy decays having a lower energy than before, we could say that now we have a negative energy, for opposition to the previous higher level of energy. And if later our lower energy increases again, we will have a positive energy because of the comparison with the lower level of energy that we previously had. Positive and negative do not exist by themselves they exist only by comparison between them. It is accepted by convention that electrons that move toward the left side have a negative charge. If the same particles moved toward the right side they would have a positive charge. For us, increasing and decreasing levels of energy and displacements from right to left and from left to right are related with different momentums of the same mechanism. Our model works with at least to entangled gravitational fields associated at two material elements. If these intersected gravitational fields vary with the same frequency but opposite phases they produce some spatial displacements that for us are fermionic particles (you could say fermionic fields if you want to). At momentum 1 field number 2 is the electron – the shared electrons of this diatomic molecule create by the intersection of those two gravitational fields – with negative charge moving toward the left side, from right to left. And in momentum 2 field number 2 is exactly the same field but moving towards the right side, from left to right. In momentum 2, field 2 is a positron with a positive charge. But they are not two different fields at different moments, they are the same field moving towards opposite directions each time and with oposite half-integer spins. The exact antisymmetry between them is created because the two intersected gravitational fields have the same frequency of variation and the opposite phase: when one expands the other contracts and vice versa. 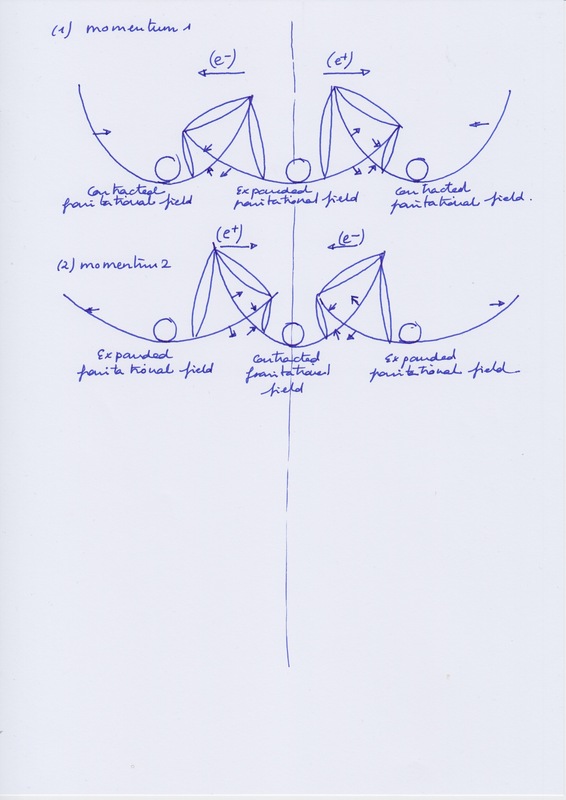 Then we could say that field 2 in momentum 1 is the anti-field of field 2 in momentum 2. If we consider field 2 at momentum 1 as an electron and field 2 at momentum 2 as a positron, it would be more exact to say that in these cases electrons are the Majorana fermions of positrons and vice versa. They acts with opposite attributes, so they are antiparticles, but they are the same particle placed at different-opposite locations in different times. When field 2 acts as an electron, at momentum 1, field 1 has the higher kinetic energy inside it and it has the higher pressure on it. Their properties at this time are the opposite to the field 3, that has the lower pressure on it and the lower kinetic energy in it. We consider that at momentum 1 field number 3 acts as a neutrino. But at momentum 2 is the field number 1 which acts as the same neutrino with an inverted symmetry. Neutrino-field-number-1, at momentum 2, has the same volume, the same low kinetic energy inside it and the low force of pressure on it, than the neutrino-field-number-3 at momentum 1, but they have an opposite direction. We can say that neutrino-field-number-1 is the antiparticle of neutrino-field-number-3 at different times, and vice versa, but in a strict sense we can not say that they are the same field-particle in different times. They are different fields. Neutrino-field-number-1 does not transmute into anti-neutrino-field-number-3, although they act as antiparticles at different times. This is because we think that neutrinos are not Majorana fermions, they only can be Dirac fermions. We could say the same about protons and neutrons. For us, at momentum 1 in the picture above – I would recommend yo to look at the pictures above to follow the explanation, because the ideas are very simple but difficult to understand easily only reading the text without any image – the neutron is the field number 1, it has the higher force of pressure on it and it creates the higher kinetic energy in it. In momentum 2, the field that has the same characteristics, the identical pressure and the identical kinetic energy is the field number 3. They both have opposite symmetry and attributes. We could say that the negative-neutron-field-number-1, at momentum 1, is the antiparticle of positive-proton-field-number-3 at momentum 2, and viceversa, but field 1 and 3 are not the same field, they are different fields, so they act as Dirac antiparticles at different times. Heisenberg guessed that neutron and proton could be the same particle with opposite spins. For us, field 3 at momentum 2 is a proton. And field 1 at momentum 1 is a neutron. In this case they have identical but antisymmetric attributes at different times, they are antiparticles but they are not the same field. For us they are Dirac fermions. We could say that neutron-field-1 at momentum 1 transforms into a neutrino at momentum 2, and that the neutrino-field number-3 at momentum 1 transmutes into a proton, the proton-field-number-3 at momentum 2. In this sense we could say that the creation of neutrino-field-number-1 represents a negative-decreasing energy because of the higher kinetic energy from neutron-field-number-1 at momentum 1, and its higher pressure, decays into the lower kinetic energy from neutrino-field-number-1 at momentum 2. In the same sense, we could say that neutrino-field-number-3 at momentum 1 transforms into proton-field-number-3 at momentum 2. 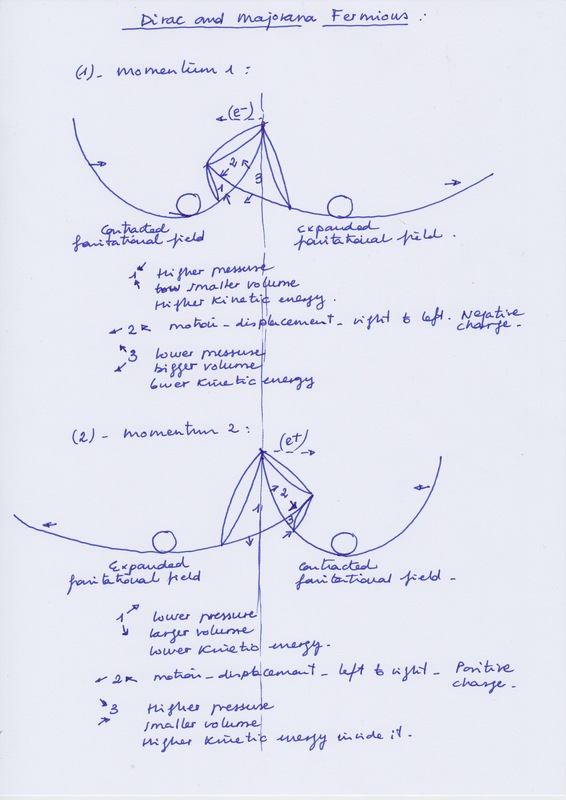 The creation of proton-field-number-3 at momentum 2 represents then a positive-increasing energy because of the lower kinetic energy from neutrino-field-number-3 at momentum 1, and its lower pressure, increases into the higher kinetic energy from proton-field-number-3 at momentum 2 and its higher force of pressure. But where are focusing our attention? when neutrino-field-number-3 at momentum 1 transforms into proton-field-number-3 at momentum 2 it occurs that neutron-field-number 1 transmutes at the same time into neutrino-field-number-1. And it occurs that the field number 2, the electron at momentum 1 or the positron at momentum 2, always displaces (in the cases of opposite phases of gravitational variation rule by Pauly exclusion principle) toward the side of the gravitational field that is contracted. When the field number 2 acts as an electron with its negative charge, at momentum 1, field number 1 acts as a neutron at the same time. But when field number 2 acts as a positron with its positive charge, field number 1 acts as a neutrino, and it has a negative energy, because the field number 1 has lost its higher force of pressure and its higher kinetic energy. At this moment, the momentum 2, field number 3 acts as a proton and it has a positive energy because it has a higher pressure and a higher kinetic energy than the field number 3 at momentum 1. On this perspective it is right to say, as Dirac did, that when positron appears there is a positive energy at the the side of the symmetry where it are placed the positive charges, or towards they are moving. Because field number 2, at momentum 2, moves toward the right side, the same side that is identified with the positive sign. But it is not right to say that the positron is the Dirac antiparticle of the electron, they are the same particle that have change its spatial position through time. Positron is the Majorana antiparticle of electron. If there were intersected more than two gravitational fields, we could observe different consequences too. For example in the case that two gravitational fields that vary with the same phase intersect with the two extremes of a central gravitational field that vary with an opposite phase, as I have drawn in the picture below, there will be at the same time in the linear molecule, an electron – field and a positron + field. These electron and positron fields will be Majorana fermions if we consider each one acting as its own antiparticle, moving left to right and right to left at different momentums. But we could consider these two fields as Dirac fermions too, if we contemplate both as different fields that exist at the same time. As conclusion: When it comes to fermions, for us Majorana antiparticles are the same particle (field) placed at antisymmetric locations at different times, periodically. The same field moves toward opposites sides each time. Dirac antiparticles are two different and antisymmetric particles (fields) existing at the same time or at different times, periodically. Finally, for us the consequences of the gravitational variations are different if the phases of variation of the entangled gravitational fields are equal or opposite. If they are equal we would have to speak about bosons, not about fermions as we did in this post. We will speak about bosons in the next post, where I am going to speak about how the Pauli Exclusion Principle could rule bosons.